NGC 2174, the Monkey Head Nebula. I went with the Hubble Palette, SHO, on this one. Exposures: 24 x 120 seconds Ha, 26 x 120 seconds OIII, 24 x 120 seconds SII. 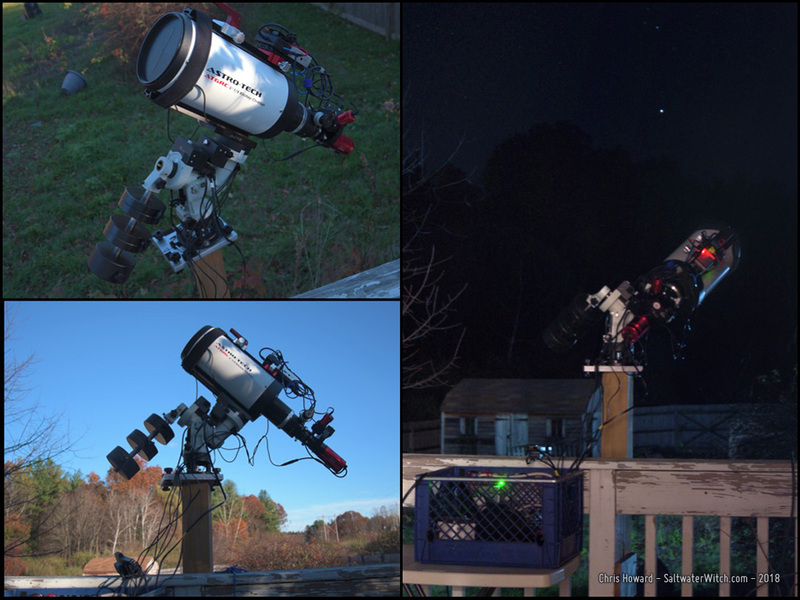 Equipment: William Optics GT81 APO refractor, ZWO ASI1600MM-Pro monochrome 16MP camera (unity gain 139/21), Astronomik filters, iOptron CEM25P mount, INDI/Ekos/KStars control software. NGC 2174 is a faint emission nebula located in the constellation Orion, about 6400 light-years away. This was a test of my field setup that I'll taking on the road in a week. 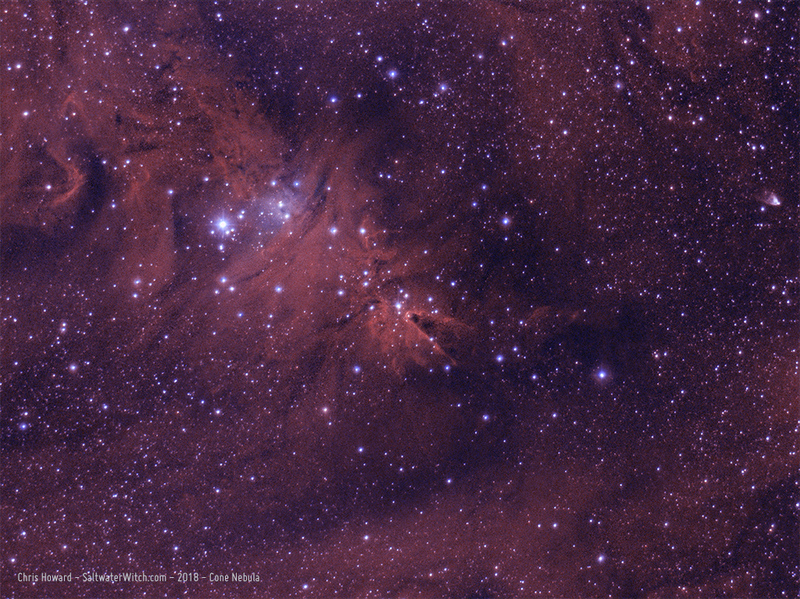 I'll have to come back to NGC 2174 with longer exposures--and more of them. And dark frames. I didn't shoot any calibration frames in this run. 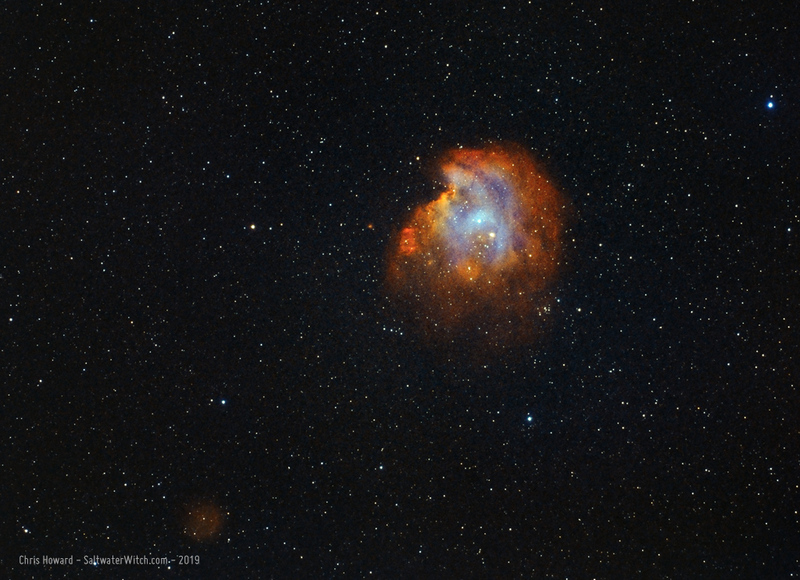 Here's my processing of NGC 2174 in Hydrogen-alpha and Oxygen (without the Sulfur frames). 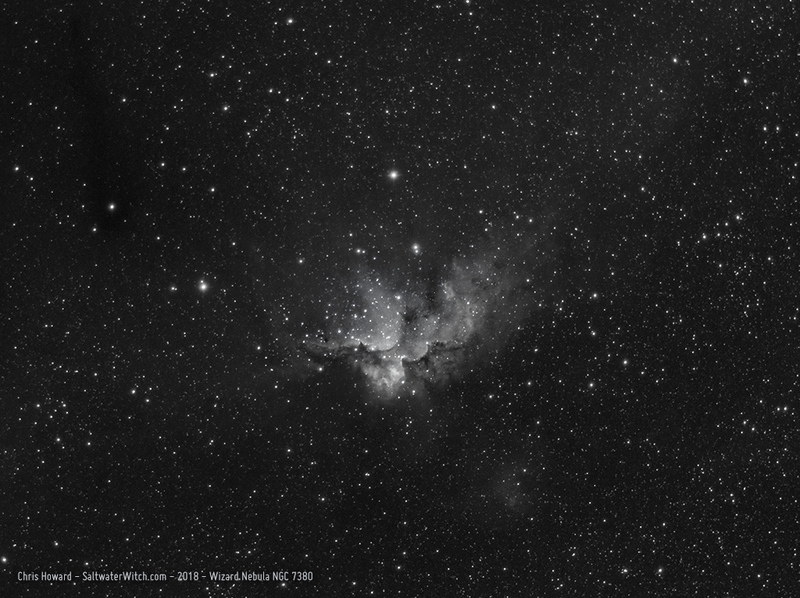 NGC 1499, California Nebula in bi-color narrowband hydrogen-alpha and sulfur 2. I captured this data on the 25th, but didn't have time to capture oxygen 3 frames with high clouds moving in and the moon rising. Even so, I like the way this turned out with the two bandpasses, almost fluorescent. 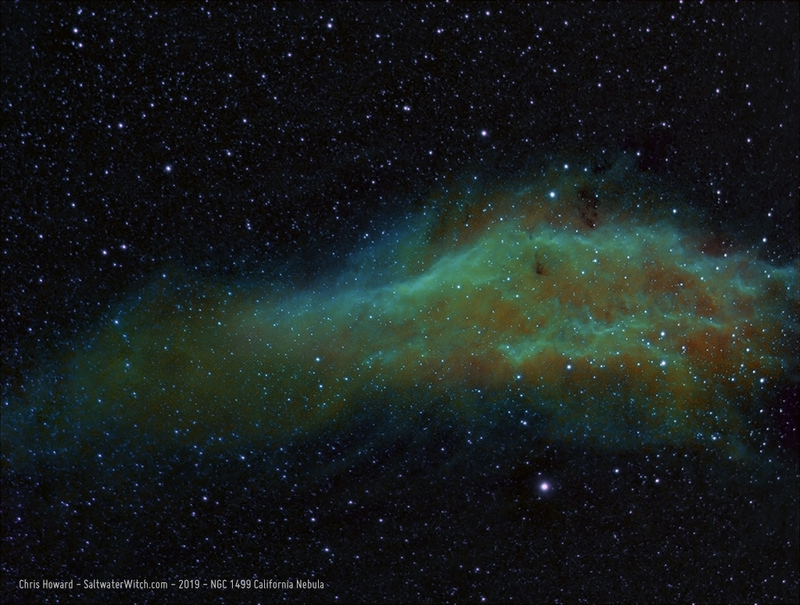 NGC 1499 is about 1000 lightyears away, and if you haven't guessed, it's called "California Nebula" because if you flip this image 90 degrees counterclockwise it looks like the state. 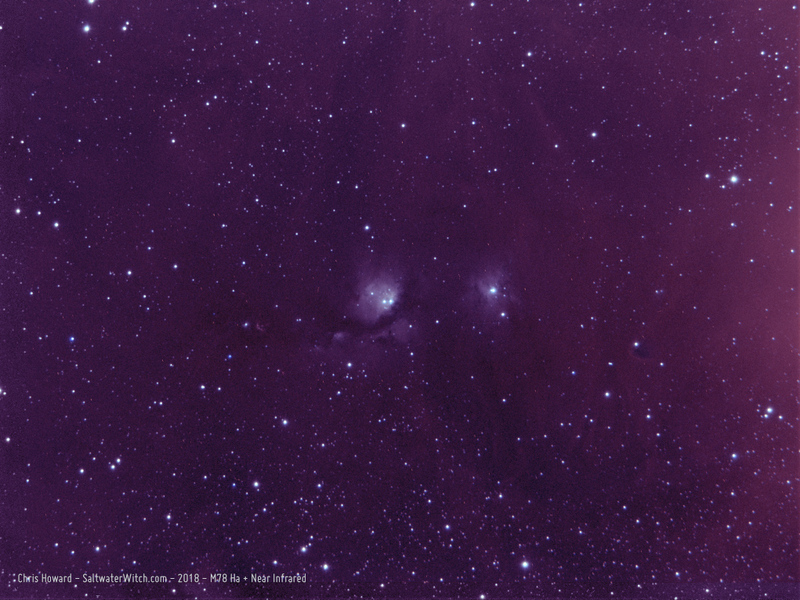 Near-Infrared: I also captured 40 frames of M78, a reflection nebula in the constellation Orion. 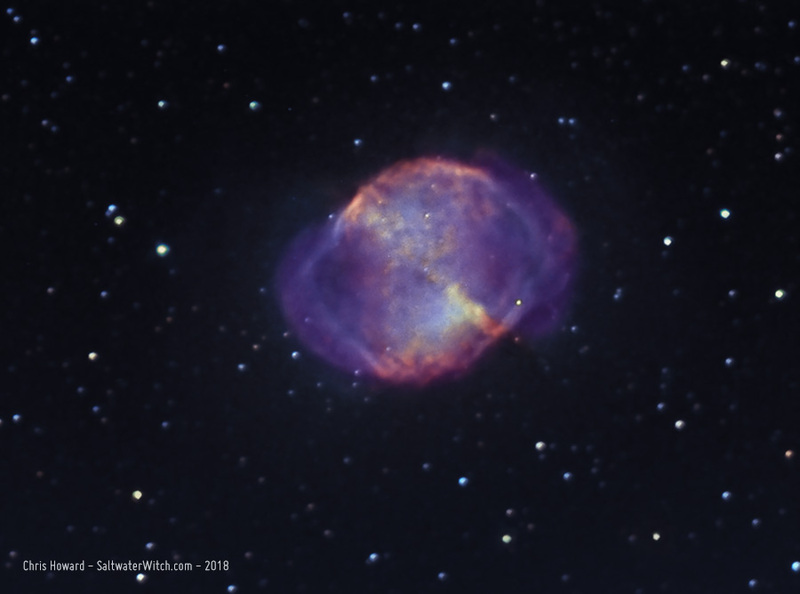 I captured 20 of each in Ha (~656nm) and infrared with the 685nm longpass filter to see what showed up, and was surprised by what I could see in the unstretched subs. There really is a lot going on at the red end of the spectrum--and beyond, and I combined both of them in this shot, divided evenly across RGB (R=Ha, G=50%Ha/50%IR, B=IR). The plan is to come back with a set of color frames and see if I can combine the whole set. 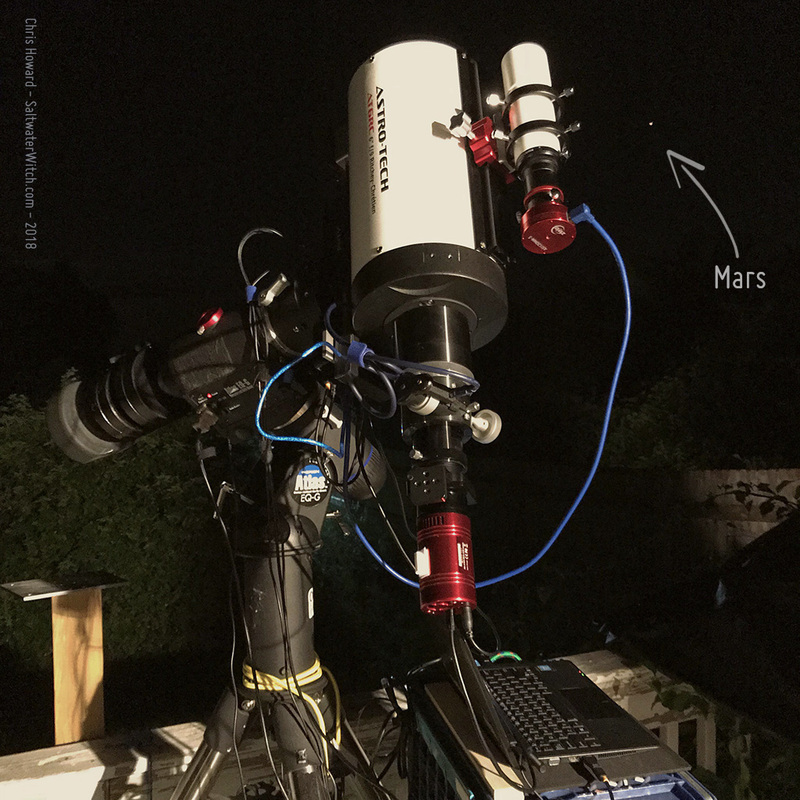 I took some pics of my narrowband setup for this imaging run, before nightfall and in the middle of shooting frames for the Cone Nebula just before Meridian Flip. 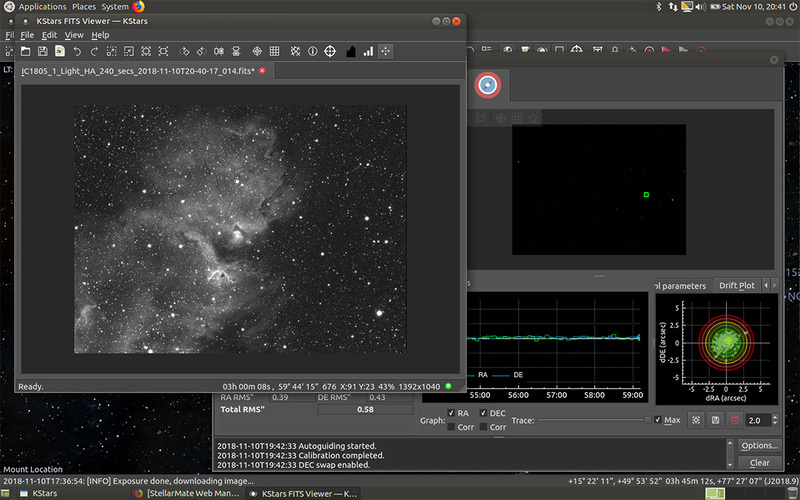 Here's a screenshot of Ekos and KStars running, with the guiding tab opened. 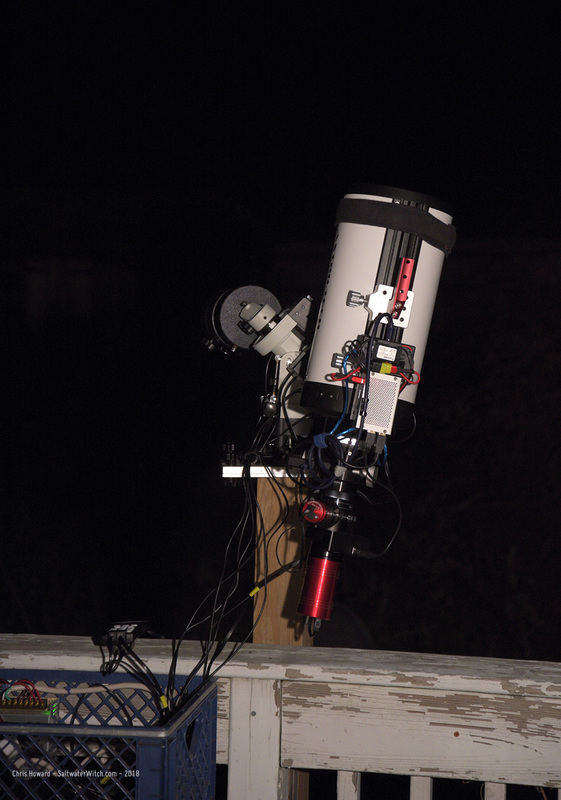 It was pretty windy, so an RMS" of 0.58 is great, but overall my guiding has improved since going to an Off-Axis Guider. 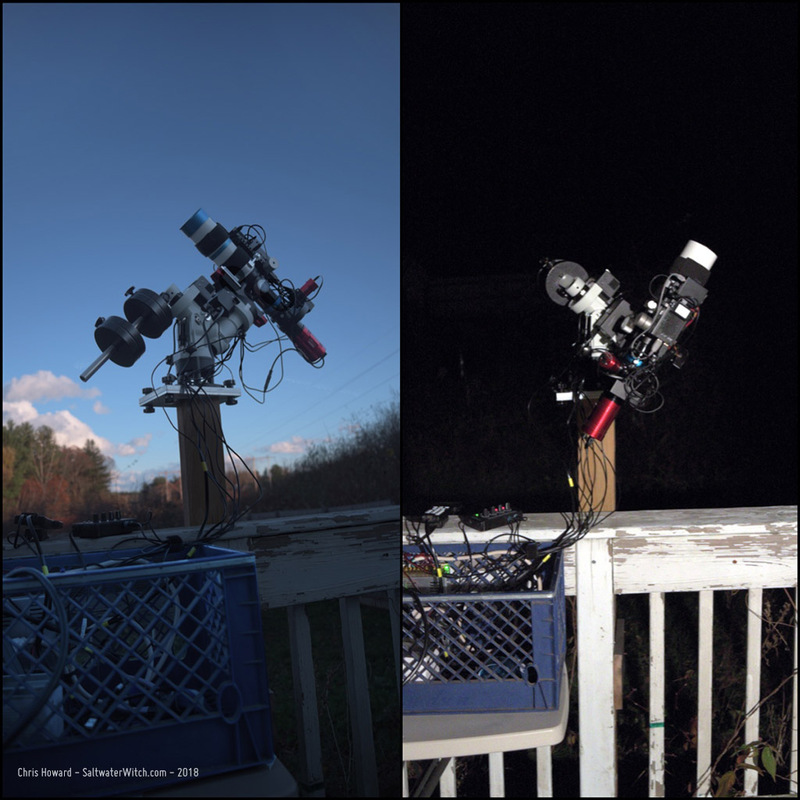 I'm now using the Orion Thin OAG on both trains--color and narrowband, and the difference is noticeable. It took some time to dial sensor and focus distances in, but results are clear, and I just don't think I'll ever go back to a guide scope. 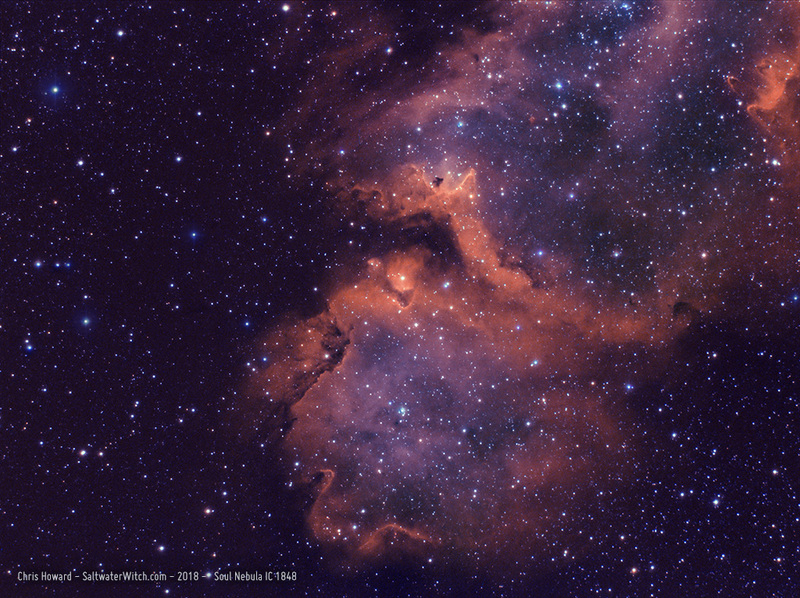 Wide-field of the Wizard Nebula surrounding the open star cluster NGC 7380 in the constellation Cepheus, about 7,200 lightyears aways from us. I reduced the saturation so that you hardly notice the differences in the RGB mix, mostly R and B because this is a bi-color set with Ha and OIII. I think I prefer this reduced color or even a completely desaturated (grayscale) version. 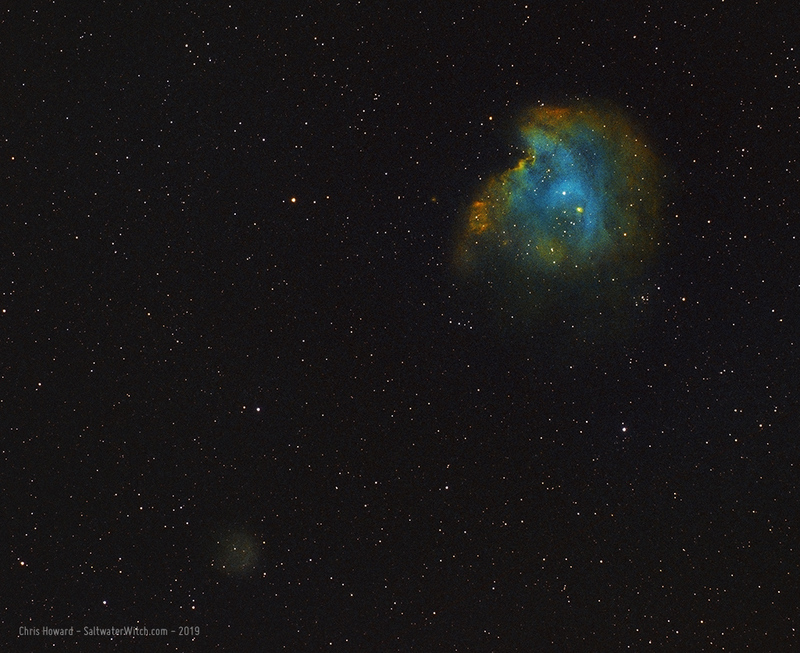 There are so many stars in this image and I'm not a fan of the off-color red and blue stars you get with narrowband. Also in this shot, I particular like the dark band at the top left. These "dark fog" or dark nebula regions consist of interstellar gas and dust that absorb the light from surrounding stars, and the constellation Cepheus has some famous dark cloudy areas, B 174, 150, and several around IC 1396. 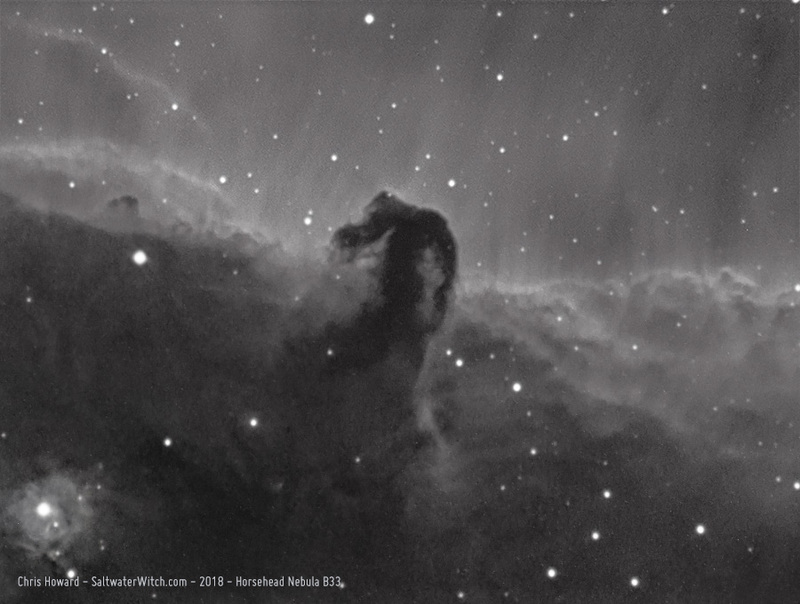 (16 x 300 second exposures in Ha and OIII, Atik 414EX mono CCD, Astronomik 12nm Ha, OIII filters, William Optics ZS61 + WO Flat F6A f/4.7, CEM25P EQ mount, Orion OAG + ZWO ASI120MM-Mini guide cam, Stellarmate OS (INDI/KStars/Ekos) running on Raspberry Pi 3b+). 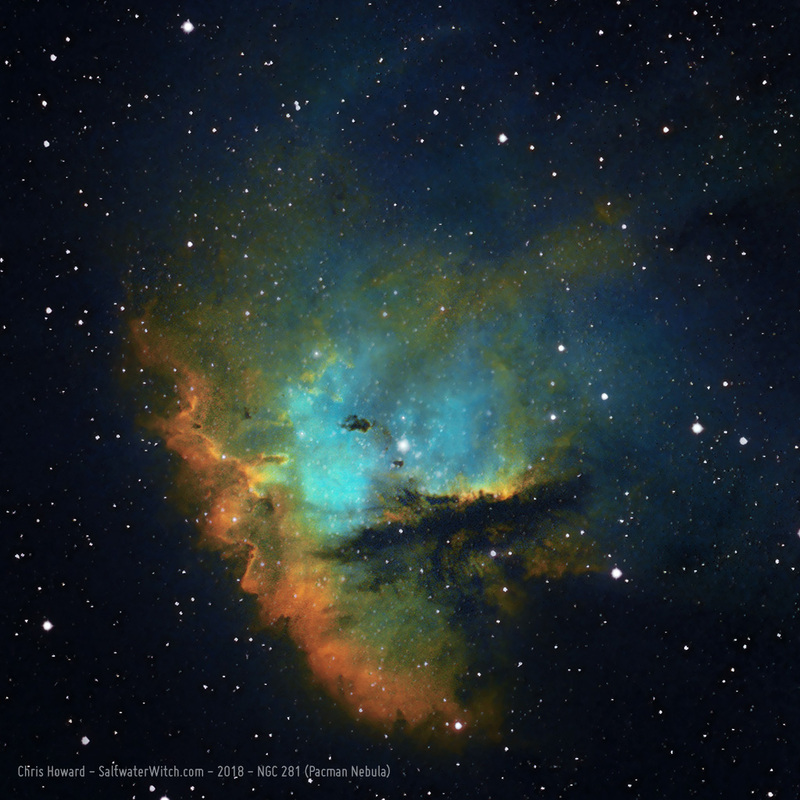 Here's NGC 281 ("Pacman Nebula") in the Hubble Palette (SII, Ha, OIII -> RGB). NGC 281 is an emission nebula, about 9,200 lightyears away in the constellation Cassiopeia. I re-stacked and reprocessed some hydrogen-alpha, oxygen-3, and sulphur-2 image data I shot several months ago, and I'm happier with this latest result than I was then. 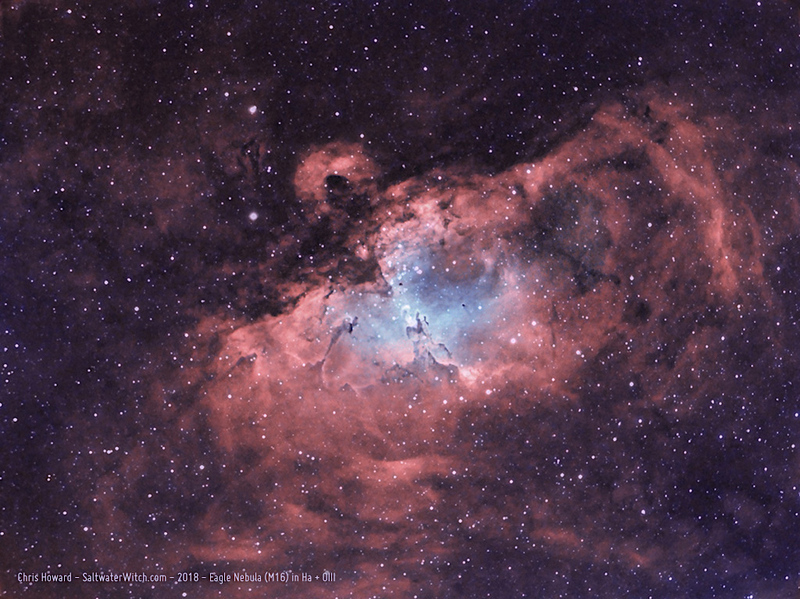 It's called the Pacman Nebula because it sort of looks like the classic video game character. 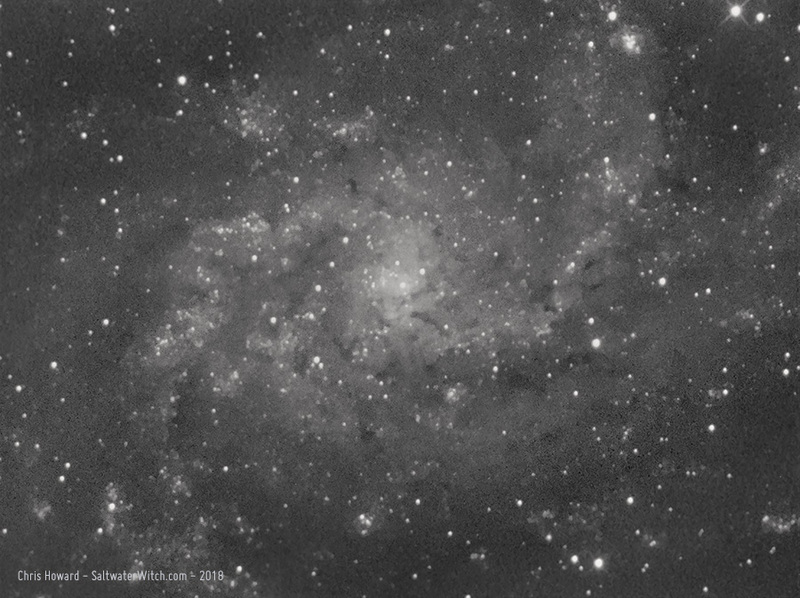 (6 x 1200 second exposures in Ha, 5 x 1200 sec OIII & SII with 16 dark frames, Atik 414EX mono CCD, Astronomik 12nm Ha, OIII, SII, William Optics GT81, CEM25P EQ mount, WO 50mm guidescope with ZWO ASI120S-MM guide cam, INDI/KStars/Ekos observatory control).